Mitsubishi introduces Eclipse Cross to the U.K. The Mitsubishi Eclipse Cross may be a new kid on the block but its stylish coupe design, pleasant cabin and punchy powertrain make it a compelling contender. 10 out of 11 (90.9%) reviewers said they would recommend this vehicle to a friend. MCF points determine the rank of the user. The higher the points, the higher the rank. Administrator reserves the right to approve and upload the review without awarding MCF points. The rank of the users represents his repuation, the higher the rank, the better the repuation is. Ranks are in ascending order. More about the ranking system click here. Collected ride and having driven for a week, realized this ride is comfortable, quiet and smooth engine delivery and transmission. Interior is very Euro-feel, leg room has been great, start/stop kick-in is not abrupt as compared to previous ride's. Head-Room / Leg Room is good. Finally, collected my very first SUV last week. Still getting use to and exploring the car features which is a lot of fun to do. I have been driving a sedan in the past and I must say that I am enjoying the ride of this EC very much. Its' high driving position let me see traffic far ahead and feel really comfortable. To me, personally, I feel it is a way better car in term of engine performance, features, audio system compare to my ex Citroen. Good responsive turbo engine, good cabin noise insulation and very good FC compare to my ex ride. I like the exterior design, a very good looking coupe SUV. Its' interior design also great and very modern as compare to other similar SUV. However, it will be great if C&C is bringing in EC equip with other features available in other countries. Overall, I am enjoying my ride in the EC and hope it will serve me well for the years to come. Had the car for 3 months now and i must admit i like the car. It was unique much like the C HR but with more space and felt more well built then the more common Vexel/HRV and nicer features and look (personally felt) then the forester or XV. A lot off people says the car drags/sluggish but that because the ECO mode is on and it limits the car a little but if you put a bit more pressure on the gas the car would react and it felt like a sporty hatchback. The car are not without it flaws if those who done their research would find out the car lack blind spot monitor, adaptive cruise and awd which is part of the package else where the car is sold. But what really this car lag is the price of the car sitting close to Outlander (7 seater) Harrier(PI), CLA (PI), GLA(PI), Scenic, Madza 6,, Forester and the XV, X-trail and yet higher to the Vexel. Nonetheless its is a unque car with sporty look of a hatchback/coupe with the road presence of a typical SUV and yet drive close to a normal day to day sedan. One of the few 1.5l turbocharged Japanese car. It has very good low and mid end torque that is very well suited for driving in Singapore. Design / styling, high ride height / ground clearance, responsive / good pickup, smooth CVT. Small boot, no auto anti-glare rear view mirror, very light steering feel, no auto door lock and unlock, no powered boot hatch. This is the best buy you can find out there right now.Tested this car a couple of weeks ago and it surprises me in nearly every aspect. First impressions is that it has a compact and fierce design, but I felt it is overdone and seems unoriginal especially the front grilles. Looks good from the side but looks weird from the back. The interior is alright.. With many bells and whistles and many gadgets as standard.. Android auto and mirror link comes as standard.. The boot space is sufficient enough for a "Standard" Family of wares.. But with the sunroofs the headspace is a bit low for tall people. Overall, this car is chique and affordable and those who drive at leisure will enjoy it with all the gadget and equipment. But the drive and handling is really not one I look forward to..
Been driving EC for a month and found the car did not disappoint me . The handling is good and very comfortable . Road noise greatly reduce.Very fast from stationary point . Thanks to high torque and powerful engine. a) Great torque for acceleration and overtaking. b) The side sills are protected by door fully covered till bottom, hence when the side body is wet or dirty no need worries your leg or pant or skirt (for ladies) getting dirty or wet. c) The side sills are more toward inner, so getting in and out make easy. d) 1.5 road tax cheaper than 2.0 or 2.4. Where you get the torque like 2.4 engine while fuel consumption like 2.0 (almost). e) The HU supplied is very stable and great for connecting Apple carplay or Android auto. f) Even it is CVT, the ratio change pattern programmed to mimic normal auto transmission (but not 100%). At least the feel is better than its own outlander and other car brand like Honda notice during test drive. h) low engine rpm example 100 km/h, ~2000rpm, pedal assume 25% Depress. i) Independent rear suspension. Torsion beam suspension is NO NO in my list when looking for new ride (unless no budget). j) the new 4B40 engine come with both direct injection and port injection. Hence the issue of carbon built up due to direct injection is minimize because during port injection mode the fuel will clean up the back of the valve. b) If you use cruise control 80~90km/hr, I find the engine control at ~1800rpm to maintain its optimum torque, and surprisingly this give better fuel consumption versus I drive without cruise control. c) Sometime depend on your load change, the turbo lag may felt at 1800rpm. d) Sometime when rpm drop <1200rpm and you sudden need to gain back speed you may felt some jerking. Not sure this is due to the turbo try to spool up again or the torque convertor full lock up engaging at the region. e) Body roll more not as good as HRV. This due to higher center of gravity. Mit selected CVT ratio not as good as honda jade/civic, hence the fuel consumption remain higher versus honda. no blind spot and adaptive cruise. This is my 6th car and my first SUV, though I drove a crossover for 7 years some time back. My previous car was a sedan with all the technological gadgets and features. With this background referenced, this review is written 3 days after collecting my Eclipse Cross (EC). So far, my EC has turned heads and opened eyes, in the carparks and on the roads. The exterior styling is simply eye catching. At red lights, other drivers and passengers have been observed pointing to and talking about my EC. Padestrians have also turned and looked as they crossed the roads. The interior is really comfortable and plush. The front seats wraps around my back nicely with good support. The dash boards and center console are very modern, very "3D" With layers that protrude out at you, not vertically flat like in the conti cars, especially the V branded one. The comparison to conti cars is because the EC is conti specced and doesnt feel like your typical Japanese/Korean cars. The build quality is solid, no plasticky squeaky parts. The drive is solid and assured yet the car is quiet, not slient but quiet. I felt serene and relaxed while cruising through the KPE through the MCE to Pasir Panjang on my first extended drive in my EC. When the shades to the 2 sunroofs are open, the EC feels airy and bright, very interesting feel, to have so much light in the cabin yet the factory tint cuts out the heat. Open the glass roof of the front sunroof and a new driving experience unfolds. The Heads-Up-Display (HUD) keeps my eyes on the roads while showing me the speed that I was driving at (especially in the KPE/MCE tunels) as well as showing me cruise control information. Back seat passengers were surprised by the leg room they had and the sound system is adequate (adjust and fine tune the settings) if you do not want to spend on In-Car-Entertainment (ICE) systems. Parking my EC was easy too, thanks to the 360 bird's eye view camera and rear camera parking assist system, in addition to the all around proximity sensors. The front and back in-car camera system gives me peace of mind while one the roads. Overal after 2 full days of driving around in my new EC, I am thoroughly enjoying driving again. I keep looking forward to the next time I get into my EC and after a 3 months wait for it, I am relishing driving it everyday. - The all important...New Car Smell!!! ... which is actually full of harmful chemicals so hope it goes away soon but still want to enjoy it while it lasts. - To keep OMV low, some features that are standard in overseas models have been removed. Its a baffling decision considering that other cheaper new Japanese and Korean cars have those features. - The piano black trims in the interior can get fine scratches very quickly if the user is not gentle and careful type. Coming from an ex-owner of Honda Odyssey, i am very pleased to say after 4 months of riding on EC, i am very pleased with this purchase. I cannot fault the FE due to my Start-Stop driving within city, but once on highway, you can easily get around 13 - 14. As for city drive, i have no complain, you can easily speed off from the traffic light with ease. Overtaking is pleasantly done with ease. if you like to be a be thrifty, just hit the "ECO MODE" At the expense of power though. interior and features wise, a couple of feature like FCM (can be a pain and also a joy) a pain, cos i think at this early stage, it is still not very mature, the FCM does activate itself for no obvious reason, but last i heard, the latest firmware introduce by C&C should address the many concerns by current EC owner. 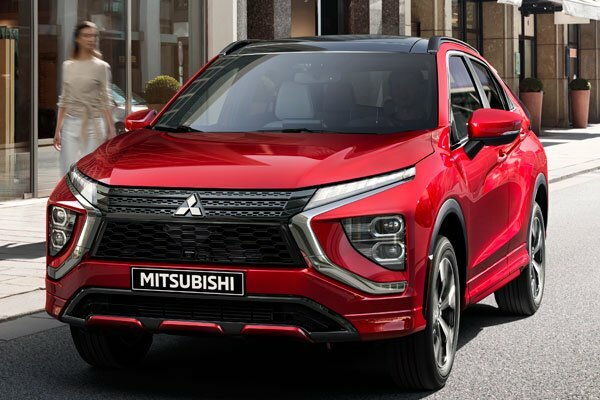 Authorised Distributor Mitsubishi cars are Mitsubishi ASX Reviews, Mitsubishi Attrage Reviews, Mitsubishi Outlander Reviews. Parallel Imported Mitsubishi cars are Mitsubishi Fuso Canter Reviews, Mitsubishi Fuso Fighter Reviews. sgCarMart is the number one car site for buying Singapore cars, including new cars, parallel import cars, Toyota, Honda, Nissan, Volkswagen, Mitsubishi & BMW. We have new car dealers comprising parallel importers, authorised car distributors, and used car dealers who have the New Mitsubishi Eclipse Cross latest price Find new car pricelists, new car launches, new car promotions, new car reviews, latest car news & car articles. Read the New.Mitsubishi Eclipse Cross consumer reviews to help you decide on buying a car. Also join our car discussion and forum discussion for car reviews, motoring news & motoring guides. Visit our partner sites who have job openings for Singapore jobs, Singapore classifieds, mover and real estate properties for sale.